Presented by Paper Balloon Theatre and supported by The Big Imaginations. On the farthest edge of a wind-battered rock there sits a small fishing town. Sometimes it feels like the town is on the edge of the world. That’s mainly because it is. The Boy lives with his Grandma, forbidden from venturing beyond the shore, but the terrifying tales told of horrors in the deep only whet his appetite - he stares at the ocean and dreams. Can one unlikely friendship save the Town On The Sea from catastrophe? Join three abundantly be-bearded storytellers as they weave a fishy tale of musical merfolk, menacing monsters and spectacularly bad town planning. With live music, puppetry, a rapping octopus and a shifting set full of surprises – this enchanting show is fun for all the family (5+). Tickets £3 per child, accompanying adult free (max 1 per child). Side by side they play by the blue sea, run through the green fields and dance in the yellow sunshine. 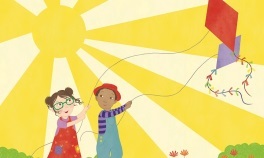 Yellow is the Colour of Sunshine is a new play told in words, sign, colours, music and movement about feelings, emotions, empathy and how we communicate. Award winning writer Brendan Murray collaborates with tutti-frutti to bring you a show full of beautiful multi-coloured delights, for children to think about, be inspired by and enjoy. This one hour show for children aged 3+ and their families.